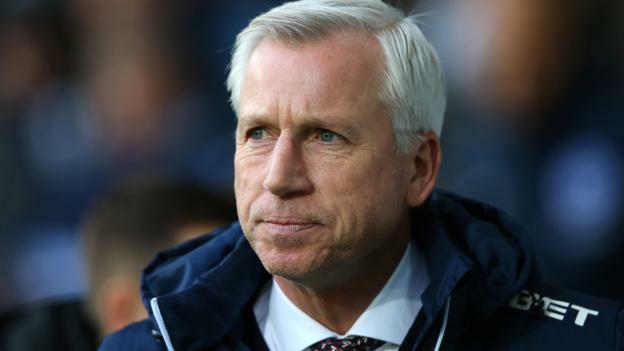 West Bromwich Albion have parted company with manager Alan Pardew after eight successive league defeats. The 56-year-old was appointed on 29 November after the Baggies sacked Tony Pulis following a run of 10 Premier League games without a victory. A 2-1 home defeat by Burnley on Saturday left bottom club Albion 10 points from safety with six games left. Coach Darren Moore has taken over the first-team and is likely to stay in charge for the rest of the season. Pardew has become the 10th permanent manager in the Premier League to leave his post this season, which is a joint record along with the 2013-14 campaign. The Baggies’ statement read: “West Bromwich Albion and Alan Pardew have agreed to mutually part company following discussions between both parties. Pardew, a former team-mate of West Brom technical director Nick Hammond, was the club’s sixth manager since 2011. West Brom won just once in 18 league games under him, taking only eight points from a possible 54. They are in their eighth successive Premier League season but have taken only 20 points from their 32 matches this campaign. Pardew’s previous job in the Premier League was with Crystal Palace, who sacked him in December 2016 with the club 17th in the table. He has managed 320 Premier League games with five different clubs. Pardew had a 34.3% win percentage at Palace, compared to 37.4% at Newcastle, 36.4% at West Ham and 26.3% at Charlton. His overall win percentage in the top flight is 34.1%. Pardew has the worst win percentage – 5.5% – of any permanent West Brom manager in the Premier League. He has won just two of his last 29 Premier League matches as a manager (D7 L20). Pardew’s departure comes six weeks after the club sacked chairman John Williams and chief executive Martin Goodman and four of his players were accused of stealing a taxi during a training camp in Barcelona. The players – Gareth Barry, Jonny Evans, Jake Livermore and Boaz Myhill – were questioned but not arrested by police, and look to have avoided legal action because of a lack of evidence. Pardew, who has also managed Reading, West Ham, Charlton, Southampton and Newcastle in an 18-year managerial career, has lost two FA Cup finals as a manager. He was named League Managers’ Association Manager of the Year in 2012 after Newcastle finished fifth in the Premier League. While West Ham boss in 2006, Pardew was involved in a confrontation with Arsenal manager Arsene Wenger, and in January 2014 he swore at Manchester City boss Manuel Pellegrini while at Newcastle. If you’d told me we’d be at this stage looking at our third manager of the season after just three wins I’d have said that was far-fetched. But it had to happen. You just can’t lose as many consecutive games. If we’d had Pep Guardiola in and he’d lost that many games, we’d have had to get rid of him – that’s just the way it is. I don’t think anyone could accuse the board of being a quick-firing operation, I just think if anything it’s too late. I’m sure Pardew’s had enough, poor man, along with his assistant, and maybe the club have identified someone that can come in now and have a look at the squad before next season, have them over the summer and do something in the Championship. Darren Moore is a club legend and he’ll have a lot of goodwill behind him. He can’t get any worse. I must say with Pardew I can’t celebrate him going because I found him to be a decent bloke and we looked to be improving when he took over. Nothing seemed to go right, the gods of football were against us. I don’t know who could’ve come in and changed things around after Tony Pulis left.